Cover it with sticky-back plastic, and Keep this with you at all times in your wallet or pocket. 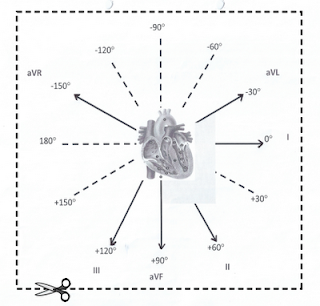 Now, wherever you go in the world, and whatever crises confront you, you will ALWAYS be able to calculate a cardiac axis. Imagine the picture above is an intersection of railway lines. (Imagine joining all the lines so that they make a star in the centre). There are 6 Train Stations, called aVR, aVL, AvF, I, II and III. The station lines have arrows on them, pointing towards the station. (Ignore the other lines for the time being, and ignore the numbers). The trains can only travel in straight lines. 3. So, what do you think happens, if a train crosses the track at right angles? This is known as ‘isoelectric’. The best bit about calculating a cardiac axis, is that you can completely ignore V1-V6 (these aren’t real “Stations”!). So cover them up and forget them. For any axis, the first thing to do, is to identify the most isoelectric lead. Remembering the 3 golden rules, which of the Stations in the example above, do you think is the one most likely to have a train crossing it at right angles? (Clue: It’s the lead with the most isoelectric pattern). 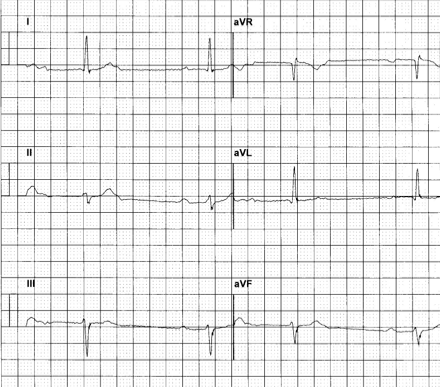 Answer: In the ECG above, the most isoelectric lead is Station aVL. So we KNOW for sure, that the train is crossing aVL at right angles! Now take a look at the Intersection picture you copied and put in your pocket. Whichever train track crosses the AvL track at right angles, is the one the train is travelling on. The line at right angles to the aVL line is station II line. So the train is travelling along line II! BUT at the moment we don’t know in which direction the train is travelling. Is it travelling towards the Station II, or away from it?? 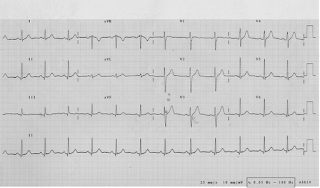 To know the answer to this question, take a look at the pattern made in Lead II on your ECG. If it’s POSITIVE then we know the train is travelling towards Lead II. If it’s NEGATIVE, then it’s travelling away from it. In the example above, Lead II shows a POSITIVE deflection. Now you get to look at the ‘numbers’ on the intersection picture. Look at the number associated with station II. 1. 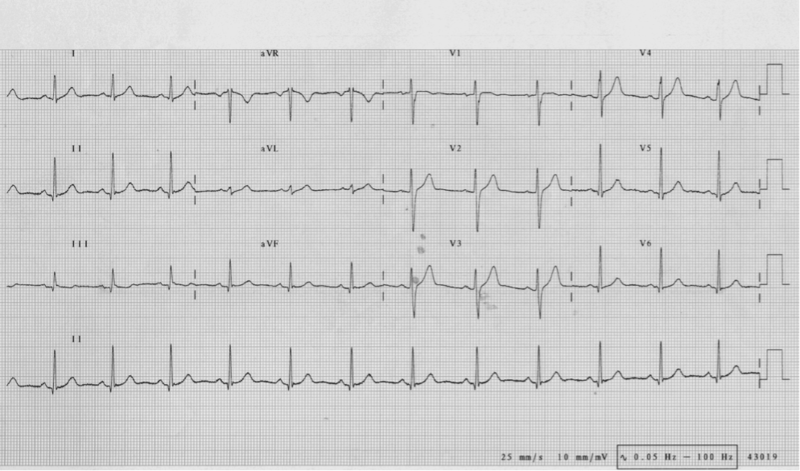 First identify the most isoelectric limb lead on the ECG. 2. Using the axis diagram – identify the lead which crosses the most isoelectric lead, at right angles. This lead represents the pathway of the cardiac impulse. 4. Read off the corresponding axis ('x' degrees) from the diagram. This process, calculates the axis to the nearest 30 degrees. This is accurate enough for most situations. If desired, the accuracy of the axis estimate, can be further improved by +/- 15 degrees. To do this, note which axis leads lay on either side of the impulse lead (see axis diagram) . then take a look at these leads on the ECG. Whether they are positive or negative will determine which of the neighboring axis, the impulse is between. Add +/- 15degrees accordingly. A Normal Axis lies between +90 and -30 degrees. An axis between -30 and -90 degrees is a LEFT Axis deviation (LAD). 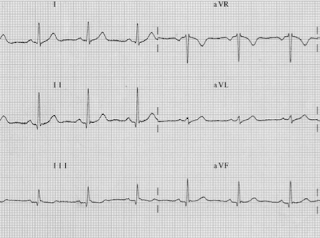 Common causes of LAD: LVH, left anterior fascicular block, inferior myocardial infarction. Can be normal variant in obese or stocky. 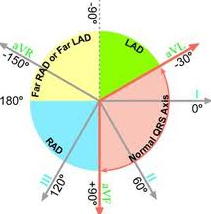 An axis between +90 and +180 degrees is a RIGHT axis deviation (RAD). Common causes of RAD: RVH, chronic lung disease, anterolateral myocardial infarction, left posterior hemiblock, pulmonary embolus. Can be normal in children or tall, thin adults. So here are three more for you to try at home! Lead aVR is the most isoelectric. So impulse is travelling towards, or away from, lead III. Lead III deflection is NEGATIVE, so impulse must be travelling AWAY from lead III. This is Left Axis Deviation. 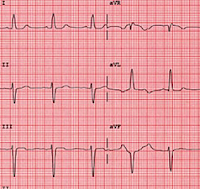 (Typical ECG pattern of LAD is "Left to Leave" - imagine the QRS complex deflections in leads I and III are repelling away from - or leaving - each other!). Lead II is the most isoelectric. So impulse is travelling towards, or away from, lead aVL. Lead aVL deflection is NEGATIVE, so impulse is travelling AWAY from lead aVL. This is Right Axis deviation. Lead II is the most isoelectric. So impulse is travelling towards or away from lead aVL. Lead aVL is POSITIVE, so impulse is travelling TOWARDS aVL . 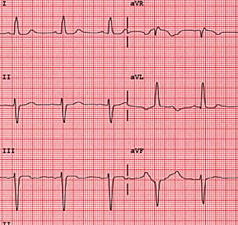 At a glance, if just eye-balling the ECG, you may have thought that this pattern looked a little like LAD (" Left to Leave" pattern as seen in Q1), but for this to be significant, lead II should also be predominantly negative. We were taught the vector method, where you add up all the QRS deflections in I and make that the X axis at 0 degrees (right = positive). You then add up all the QRS deflections in III and make that the Y axis at 90 degrees (down = positive). You then draw the resultant vector and see what angle it's pointing at. e.g. if I adds up to +3 and III adds up to +III you end up with a vector at 45 degrees. What do you think of this method? It seems to me more intuitive than wondering about what is at right angles to what all the time, but then I am quite a numbers/graphy type person! Hi Jamie. Thanks for your comment and for taking time to look at my blog. I can't disagree with you - The vector method is the traditionally taught method, and certainly the most accurate. If you are comfortable with that method, and good with numbers, then stick with it! The problem is, not everyone is comfortable with the vector method, and many people find it quite difficult to get their head round it. This is just an alternative suggestion - and was really just done for a bit of fun! However, I got some great feedback - many doctors felt they had suddenly had a 'penny dropping moment' in finally understanding cardiac axis. First of all thanks for this great explanation. I understood the stuff really well. 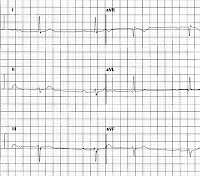 Just wanted to ask, is there is mistake in the answer to the third ecg or have I missed out on something? Im refering to the +30 .. should it be -30 since that is the number associated with aVL? but i did not get the right angles ? Hi :) thanks so much for the explanation! Was really helpful! Just wanted to tell you : our professor told us tthatonce you find the lead that is perpendicular to the isoelecric lead, in order to know which value of this lead is actually the value of the cardiac axis, you look at the net amplituse of the QRS complex pf that lead and if it s positive, then you take the positive value of the perpendicular lead as the value for the cardiac axis. So, in for instance the third example, the answer ould be +150 deg.. I'm a med student and I love your method. thanks! A patient is connected to a three-lead ECG monitor that monitors Lead I, II and III waveform. a. If the Lead II peak amplitude is 11mm and the Lead III peak amplitude is 13 mm, what is the cardiac vector angle? b. What peak amplitude is expected for the lead I waveform? c. Include a Sketch of Einthoven’s triangle and the projections of the cardiac vector onto each lead axis. d. Sketch 2-3 beats of each of the three ECG waveforms. 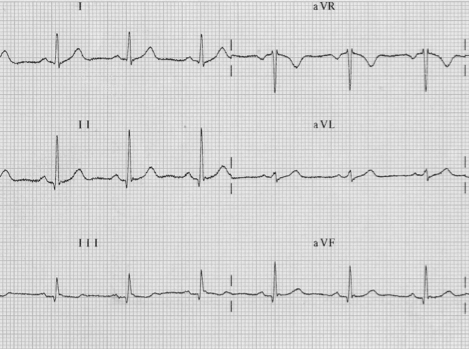 #ECGclass Case 13 - AF or not AF?